Confirming a previous report from last week, Qualcomm announced its Snapdragon X1 platform designed for augmented and virtual reality devices during an event at the Augmented World Expo in Santa Clara on Tuesday, with Meta and Vuzix among the first manufacturers to adopt it. With power consumption and thermal efficiency optimized for interactive AR experiences, the XR1 combines an ARM-based multicore central processing unit (CPU), vector processor, graphics processing unit (GPU), and AI engine to run on-device machine learning for pose classification and image recognition. Snapdragon will also provide an XR software service layer, the Snapdragon XR Software Development Kit (SDK), and connectivity and security technologies for the platform. The Snapdragon XR1 supports 4K resolution for VR displays and includes the company's Spectra image signal processors (ISP) for rendering high-quality AR content. The platform also provides hardware acceleration in display processing to handle 3D content, advanced vision processing capabilities to facilitate AR functions like visual inertial odometry (VIO) for pose estimation, and support for head tracking. On the audio side, the platform facilitates high-fidelity audio as well as always-listening voice commands for virtual assistants. "As technology evolves and consumer demand grows, we envision XR devices playing a wider variety of roles in consumers' and workers' daily lives," said Alex Katouzian, senior vice president and general manager of the Mobile Business Unit at Qualcomm Technologies, Inc., in a statement. "By integrating powerful visuals, high-fidelity audio, and rich interactive experiences, XR1 will help create a new era of high-quality, mainstream XR devices for consumers." Vuzix today elaborated on how it will use the Snapdragon XR1. The company will include the platform in its next-generation Blade and enterprise-focused M-series smartglasses in 2019. 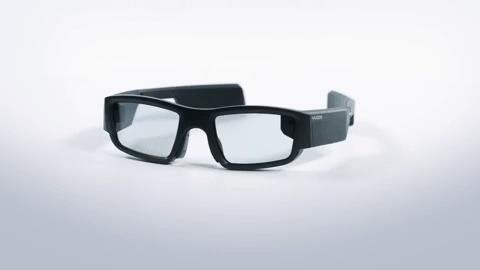 "Qualcomm's Snapdragon XR1 platform will help Vuzix advance our AR Smart Glasses regarding power efficiency and deliver smoother user experiences along with better overall system performance," said Paul Travers, President and Chief Executive Officer at Vuzix, in a statement. "Qualcomm's XR1 platform combined with other leading technologies will enable Vuzix to push the envelope on form factor on our next generation waveguide based Vuzix Blade Smart Glasses without sacrificing the overall performance of the glasses." Likewise, Meta will adopt XR1 for its own next-generation device, though the company did not disclose a timeline for its release. "Meta has been working closely with the Qualcomm team and the new XR1 platform. We are basing our next generation augmented reality glasses under development on this platform. We view the XR1 platform as an important part of our strategy to develop smaller, more intelligent augmented reality headsets and glasses," said Joe Mikhail, CRO at Meta, in a statement to Next Reality. Having a dedicated chipset with capabilities that cater to augmented reality experiences is a key step to evolving AR hardware. The XR1 promises to deliver processing power and battery efficiency necessary to accommodate AR content for extended periods of time. "As XR content developers we can't wait until Qualcomm's XR1 and upcoming 845 chipsets become integrated with the wave of standalone VR headsets and emerging AR glasses and head-mounted displays. The capabilities within these mark huge leaps when it comes to giving developers more space and features to work with. We will be able to create richer and highly visual experiences that will be more natural with elements like voice recognition, eye tracking, and other optimization features," said Tommy Palm, CEO of Resolution Games. In turn, manufacturers will be able to produce displays, optical engines, and batteries with a smaller footprint that enables a form. In a nutshell, Moore's law is at work.